Rep. Dawn Keefer (R-York/Cumberland) joined her colleagues in taking the oath of office for the 2019-20 Legislative Session on Tuesday at the Capitol in Harrisburg. HARRISBURG – Rep. Dawn Keefer (R-York/Cumberland) was joined by her colleagues in the House of Representatives today to take their oaths of office for the 2019-20 session. Keefer enters her second term representing the people of the 92nd Legislative District. 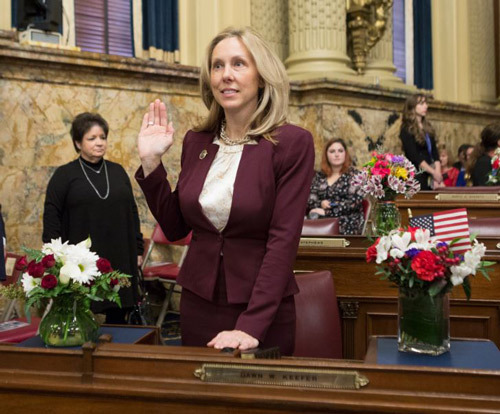 During the 2019-20 session, Keefer will continue her work against unneeded regulations and tax increases that are harming Pennsylvania’s economy and its homeowners. “Conservatives in the House put a stop to broad-based tax increases proposed during the 2017-18 budget that would have impacted every Pennsylvanian. I am proud of the work we did, and look forward to continuing our efforts to curb costs and save taxpayers from unnecessary tax increases this session,” Keefer said. For more information about Keefer’s legislative priorities, or any other state-related issue, contact her district office in Dillsburg, located at 12 N. Baltimore St., by calling 717.432.0792. Information can also be found online at RepKeefer.com or Facebook.com/RepKeefer.